Cake seems to be ever-present in my house sometimes. Between all of the birthdays and holidays in-between, there’s often some kind of cake or cupcake around. Usually they’re homemade, but lately my grandmother’s been fond of popular bakery about an hour’s drive away. They make pretty good cakes. 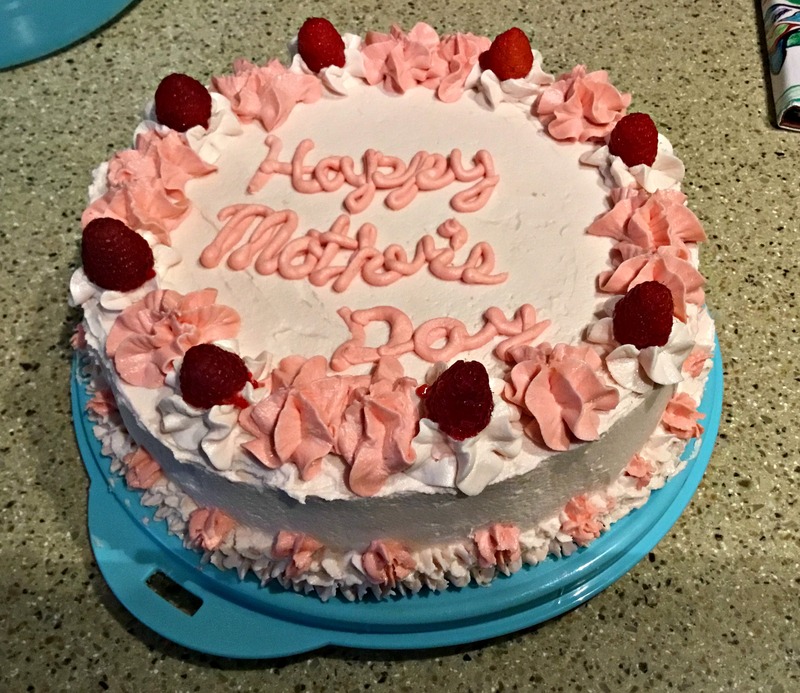 But after some thinking (and a small suggestion on my part) she decided the time and money to get them wasn’t worth it for Mother’s Day this year. I really like making cakes, so I was happy to be given the weighty job of making the desserts. 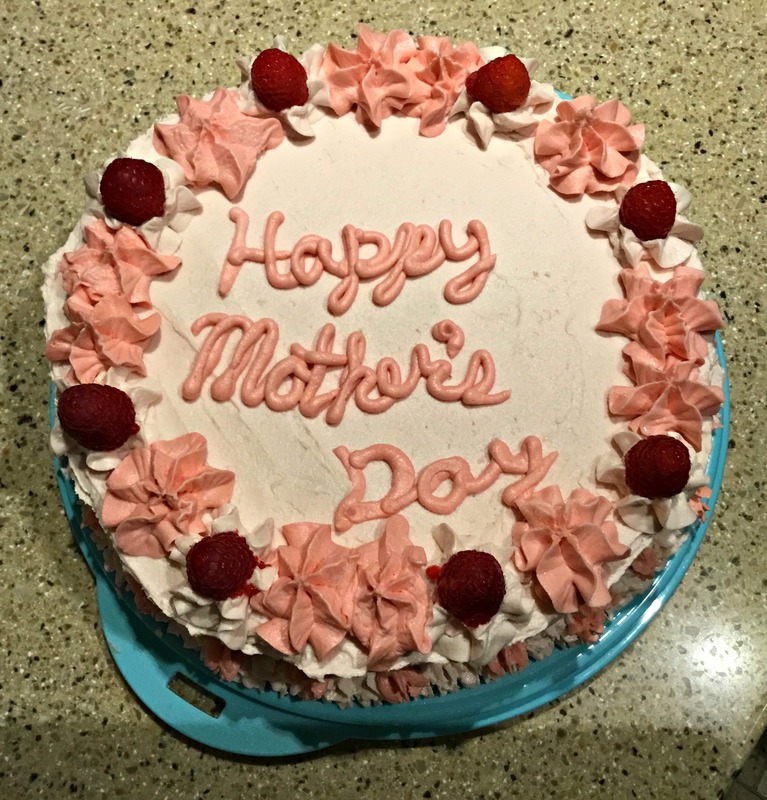 It came with specific instructions: a chocolate cake with plain buttercream frosting for my mom, and a (biggish) yellow cake with lemon filling and raspberry buttercream for my grandmother. The decorating was up to me. I’d like to say cakes themselves were totally homemade, but…who has the time? Instead I used Betty Crocker mixes and a Devil’s Food one from Duncan Hines. They’re light and moist, and super easy to make. Before this I’d never made flavored buttercream or any kind of filling. Embracing the challenge, I flew to the internet in search of good recipes. Wilton, the brand for baking supplies, has a great raspberry frosting recipe. Everyone in my family who tried it liked it—even if they’re not big raspberry fans. Wilton also has my go-to buttercream frosting. It’s delicious every time. The lemon filling was a little trickier. A lot of recipes required eggs, and I’ve seen too many crème Anglaise gone wrong on Food Network to not be nervous. Essentially, the eggs can go from ideally delicate and warmed to chunky and scrambled fast. So I chose a recipe from Betty Crocker that was egg-less. It tasted good, but I don’t think I cooked it enough. Despite hours in the fridge, it never set up. Instead of a creamy filling it became more of a liquid glaze. My solution was to brush it onto both layers, and then use the frosting as a filler. For decorations, I tried ‘drawing’ on a cake for the first time. 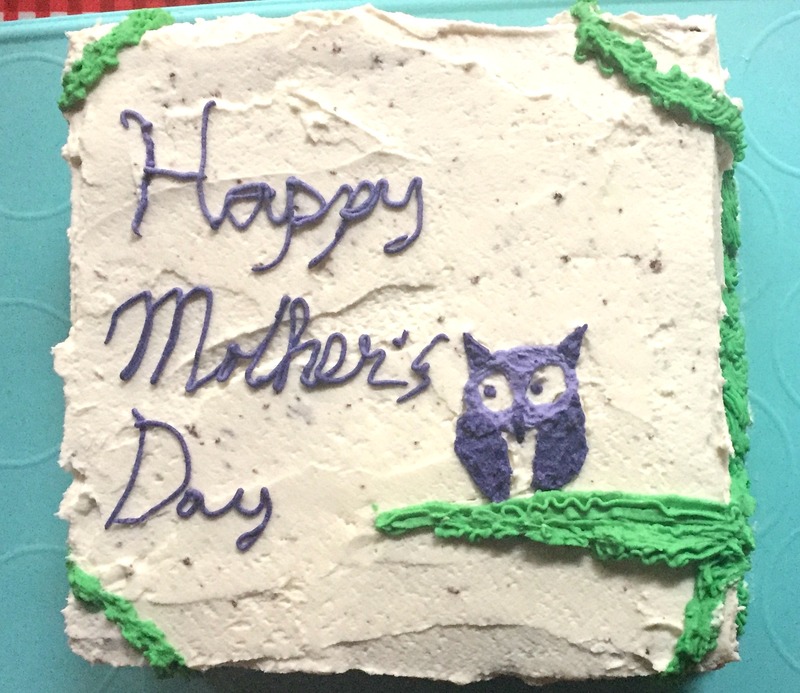 It was a little, purple owl for my mom’s cake. She had insisted on not stressing about doing any kind of design, but she deserved some kind of personalized cake. Green was a nice compliment to both the subject and purple color, so I made a little support for the owl and brought it down into a bottom border. I wanted to do something more formal for my grandmother. When I googled ‘raspberry cake’, almost all of the images depicted a fairly simple cake topped with fresh raspberries. Strangely, they reminded me of a cake in a Mario Party 8 mini-game. The end result was a combination of abstract flowers and the raspberries. I added a small amount of red food coloring to the raspberry frosting to make the darker pink color. So if you’re ever looking to try out new baking recipes, I recommend perusing through Wilton and Betty Crocker’s online selections. This certainly isn’t sponsored, by the way, but Wilton’s frostings are always popular when I’ve made them, and this Betty Crocker lemon filling was delicious (even though I didn’t cook it enough to be a thick filling).